I don't want to be a Job's Comforter or a Prophet of Doom. I want to join in the celebrations of the ousting of a corrupt and evil dictator. But unfortunately I have a gut feeling that as the euphoria of winning the battle of Kyiv starts to evaporate, reality is going to set in and it's not going to be pretty. No armed protest ends in a brightly-coloured gift wrapped parcel with pretty ribbons and bows on it. Victory by force is ugly. There are always repercussions and consequences and some of them are not pleasant. Before the protests how many people around the world had even heard of Ukraine and knew where it was? How many thought it was still a part of Russia? The protests have highlighted Ukraine's problems to the world. They've never managed to quite escape from Russia's leash; you have opposition parties who although were united in their desire to oust Yanukovych, weren't united in much of anything else; you have a divided country consisting of Ukrainians who want to be a part of Russia and Ukrainians who want to be a part of Europe; you have numerous corrupt politicians who have decimated Ukraine's economy for their own financial gains so that the country's coffers are so empty spiders have started building cobwebs there; you have a middle-aged woman in a wheelchair with a bad hairstyle who was jailed for corruption who wants to be the new president; you have an ex-boxer with a charming smile who upset the masses when he shook hands with Yanukovych after the phony peace agreement who also wants to be president; you have lawless criminal titushkis still running around, many with weapons; you have protesters who played an active part in the fight with blood on their hands, a veritable boiling cauldron full of testosterone, ready to fight at a moment's notice; you have Europe dithering about economic aid packages and lastly you have Putin and Mother Russia. Russia's fleets are based in Ukraine. Russia sends Europe 1/4 of its gas supply through pipelines through Ukraine. Ukraine builds planes, military weapons and nuclear arms for Russia. Do you really think Putin is going to give that up without a fight now that the distractions of the Sochi Olympics have passed? The Russian envoy to the peace talks refused to sign the agreement. That says something. Putin told Yanukovych to be heavy-handed and stamp out the protest. That shows his thinking. So not to be a Prophet of Doom, but I don't think getting rid of Yanukovych so quickly means an immediate happy ending for Ukraine. There is a long road ahead. A road filled with unseen potholes, and you never know what might leap out and hit you. Too much testosterone roaming the streets looking for a fight. Unsatisfied people who are not united in their view of what the future for Ukraine looks like. And the West and Russia pulling from both sides. Something's got to give. 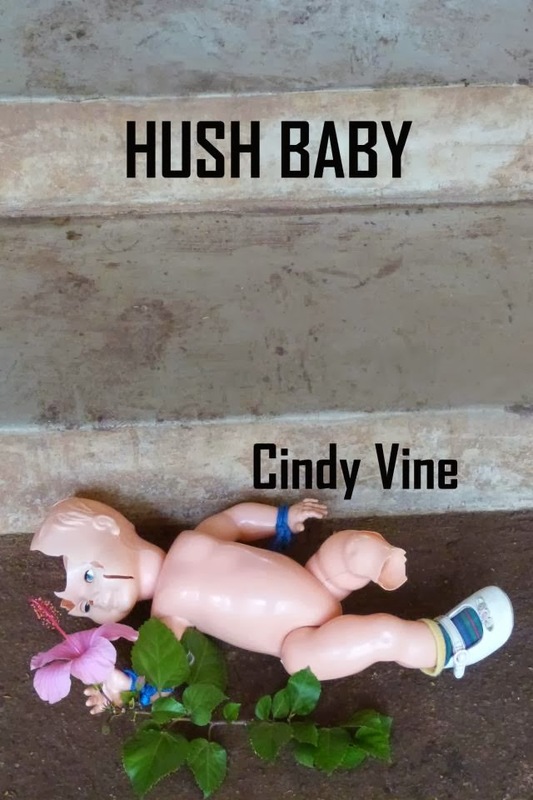 Cindy Vine currently lives in Kyiv and is the author of Hush Baby and The Colorful Art of Pain, both available on Amazon.com as kindle books or paperback. I've always been proud to be a South African but today as I watch the live feeds from Maidan and the struggle of the Ukrainian people as I sit in the relative safety of my apartment, I have to wonder about my citizenship. Is being a South African all that great? Because really, having a South African passport in Kyiv has got me trapped. For starters we have no embassy here. So that means that I am not on any embassy list, I do not receive embassy updates on the situation and travel warnings. I don't exist. That also means if foreigners need to get evacuated in a hurry, I have no embassy arranging my evacuation. I am stuck here. My place of work does not have an emergency evacuation plan. If they do have one I don't know about it or what it contains. I can't slip over the border into another European country like all the other staff can do, because South Africans need a Schengen visa to visit Europe. A Schengen visa takes ten working days and requires an original bank certificate from my bank - which happens to be in South Africa. No can do. Also, all those embassies are shut at the moment. I can't fly to the UK because even though South Africa is a part of the British Commonwealth and we take part in the games, and we fought two world wars for them, gave our blood for them, we require a visa to go and visit them. Maybe it's because we regularly beat them in rugby and cricket. So for all intensive purposes I am trapped in Kyiv and it seems to be intensifying today. Lots of explosions and ambulance sirens. When I arrived here in September 2013, I thought Ukraine was a peaceful country. I knew that it was looking to move closer to the EU and I thought it would be a perfect gateway for me to explore Europe. All that changed on the 21st November 2013 when President Viktor Yanukovych decided not to sign a Free Trade Agreement with the European Union. The people were upset, they protested and gathered in Independence Square (Maidan) to hold rallies to voice their protests. Yanukovych, who hit the spotlight in the peaceful Orange Revolution a few years back in 2004 when he was accused of electoral fraud and rigging an election, wanted to move closer to Russia's welcoming arms. The people of Ukraine, however, find Russia's arms more strangling than welcoming and so they got upset. The protests and rallies were initially peaceful until riot police called Berkut, tried to forcefully remove the protesters on the 30th November. The police presence increased, more and more protesters arrived from all over Ukraine and set up camp in Euromaidan, turning it into a well-equipped tented village. The government was unimpressed. Every weekend, thousands, sometimes hundreds of thousands, of people attended Euromaidan rallies led by leaders of the opposition parties. Into this mix arrived bands of government-funded thugs called titushki, many of whom spoke with Russian accents. (Interestingly although many Ukrainians speak Russian, the accent is different to when Russians speak Russian and they can identify Russians from the accent.) These titushki dress like the protesters and mingle with them and wreak havoc amongst them. They are responsible for kidnapping various high profile protesters, some of whom made it back alive after being left for dead in the forests, looting, beating up innocent bystanders, egging the US Embassy, burning cars of protesters and initiating violence between police and protesters. They provoke the police deliberately so that the police retaliate forcefully against the protesters causing violence and intensifying the unrest. Of course, throughout these past few months journalists have also been targeted by police and titushki, some beaten badly, some even killed. Just last night titushki pulled a taxi off the road, beat up the occupants of the taxi including the driver, and shot and killed a journalist who was in the car. Police have been heavy-handed, using live ammunition and not just rubber bullets and tear gas. Protesters have an armed self-defence unit who are radical and who fight back to protect the people at Maidan. Not many have modern weapons, most resort to more medieval measures. They built a giant catapult, dug up paving stones from the roads to use as missiles, armed themselves with sticks, baseball bats and shovels, collected tyres to burn, created barricades and built up a stock of bottles to make molotov cocktails. Many would say they have no chance against the well-equipped Berkut, but they have the desire to change the Ukraine and the conviction of their beliefs to give them strength to withstand the dark forces. Police have captured and tortured protesters, making them strip down and parade naked in sub-zero temperatures. The government brought in Draconian anti-protest laws. The people got more angry. This was not a healthy situation. The opposition leaders called for the corrupt government to stand down, for there to be immediate elections. The government signed a multi-billion dollar bailout deal with Mother Russia, sealing Ukraine's fate. An amnesty was achieved when the opposition agreed to vacate government buildings they had taken over in exchange for all protesters in prison being set free. The minute the government buildings were vacated and some barricades were being dismantled, the government made its next move and flooded the streets with thousands of Berkut armed and kitted out in their riot gear. Their mission was to clear the Maidan of protesters. 20 000 protesters held firm behind the smoky remains of blazing fires that kept the Berkut at bay throughout the night. 25 dead so far, over a thousand injured, the stand-off continues. The last time Ukrainians made a stand and got rid of the corrupt Viktor Yanukovych they managed to bring in a West-friendly government. The constitution changed, it was a real democracy. At the time that scared the living daylights out of Putin. He believed and probably still believes, that Ukraine is still a part of Russia, just another state. Therefore he watches Ukraine's every move, threatening economic sanctions if they don't succumb and bow down to his will. Putin does not want Ukraine to have anything to do with the EU, he wants them firmly ensconced in Russia. He dangles economic aid like a carrot. You have to remember that Kyiv is the cradle of Russian civilisation. It used to be the capital city many years ago. I have to wonder though, if the people protested against Yanukovych in 2004 and got rid of him then because of his corruption and greed, why did they vote him back into power in 2010? It makes no sense to me. What is happening in Kyiv is spreading all over the Ukraine. 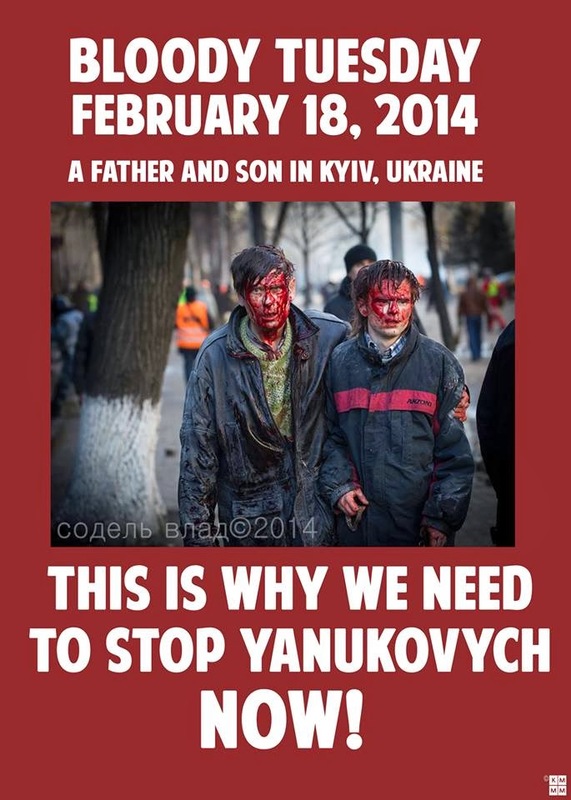 Putin must be angry with Yanukovych now for not having stamped this rebellion out at the onset. One wonders when Big Brother will come to his rescue. Will there be more Human Rights abuse in the Ukraine? Excuse the pun but that is the burning question. One has the feeling that there can be no winners here. It is a lose-lose situation. The opposition doesn't have enough control over the more radical elements of the protesters to make them toe the line. The people of Ukraine are united in their dislike of the government but not united in whom they support in the opposition. The potential withdrawal of financial aid from Russia if Yanukovych doesn't do what they demand and the West's humming and hahing of how best to help Ukraine has left the president with little choice. Cindy Vine is a teacher and author currently living in Kyiv. She is the author of Hush Baby, The Colorful Art of Pain, CU@8 and Defective. All her books are available on Amazon as kindle books and paperbacks. Valentine's day is all about love. The love you have for your current partner, an intimate kind of love. The love where you want to share your very being with someone else. Valentine's Day is not about the lasting love you have for your children, family, friends, pets. The love you feel for your city when the plane touches down and you see Table Mountain before you. That love is not celebrated. Instead we give cards and gifts to lovers who slip in and out of our lives. Fleeting moments we try desperately to hang onto. I have never been lucky in that intimate kind of love. Bad choices, never choosing someone who is good for me. I accept all the blame for that. Loving someone so much that you lose yourself and who you are is not love. My grandmother always used to say that you can't be loved until you love yourself. When you forget who you are and try to be someone you're not then you are not loving yourself. My last relationship was the final straw for me. It made me realize that I am not relationship material. I let the other person become all-consuming so that I forgot who I was. That is not good. I'm not sure if it was that final relationship and final betrayal which killed that ability to love another intimately or if it was the scalpel which cut out the cancer which cut that kind of love out of me, but I just know that I don't feel it anymore. I don't even miss it or long for it. That part of me has gone. Dead and dried up. But this isn't sad, it's good. It means that now I focus on me and my children. 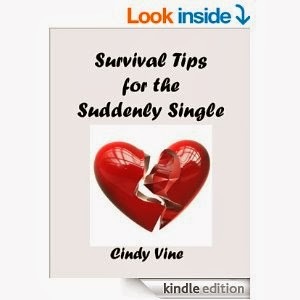 Cindy Vine is the author of Survival Tips for the Suddenly Single and Fear, Phobias and Frozen Feet - both are available on Amazon in kindle and print format. Sometimes I feel like I am hanging onto a small plant growing out of the side of a cliff face. If I let go or the plant's roots give way I'll fall. Will I survive? I'd have to fall to find out, won't I? I don't plan on falling. 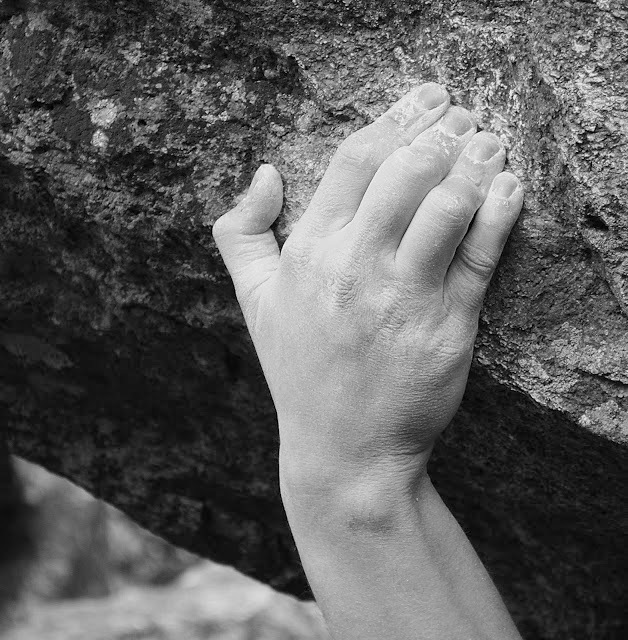 I plan to hold on even if it is one arm at a time while I rest the other arm. The world is filled with people who are holding on. Some give up and fall, some fall asleep and accidentally let go, and then there are the stubborn ones like me who are too mulish to let go. So I have not sold a million books but I have sold quite a few thousand. Will I stop writing? No, I have many more books hiding inside me. My wallet might be empty but my head is full of ideas. I have never managed to work out why some people's lives are a constant struggle and others just have everything falling in their laps. I am a little envious of the lucky lap people though. Okay, understatement. I am a lot envious, pretty green with jealousy in fact. But then I wonder if they get everything so easily if their lives will be as rich with memories and achievements of overcoming different struggles as mine has been. Maybe I subconsciously always choose the path of most resistance. Maybe I am a masochist who thrives on struggle. Maybe it is not just bad luck, maybe I do have some influence. Too many maybes for me to reflect on. I can't afford to be distracted with reflecting and pondering on the hand I have been dealt. It might cause me to lose focus and let go of that flimsy branch that is keeping me from falling off the side of the cliff. Living abroad is not always easy. Today I find myself missing my family, friends and home quite desperately. Luckily homesickness is like a common head cold. It does go away. The key is to keep your mind occupied. My problem is that my mind is always over-occupied so to ease the action going on inside my head I think about home. As stated previously, too much thinking is one's undoing. I should be writing, or knitting, or reading or watching a movie. You'll note that shopping is not in my list of what I should be doing. Retail therapy is not therapy for me. Too expensive, the budget doesn't allow for it. I need to start saying that word out loud more often. Budget. Budget. BUDGET. If I say it more often I might stick to it. Too little money, two households to run, child's studies to pay for. Thinking about it does my head in and I think I might let go of that fragile plant. But there are others worse off than me. Some don't have a plant to hang onto. All they have is a small crack in the rock face that they have managed to dig their fingers into. Time to focus on the silver lining. They say every cloud has one. It's completely overcast outside today, plenty of clouds, innumerable silver linings. Maybe I should pick a couple to see me through the day. 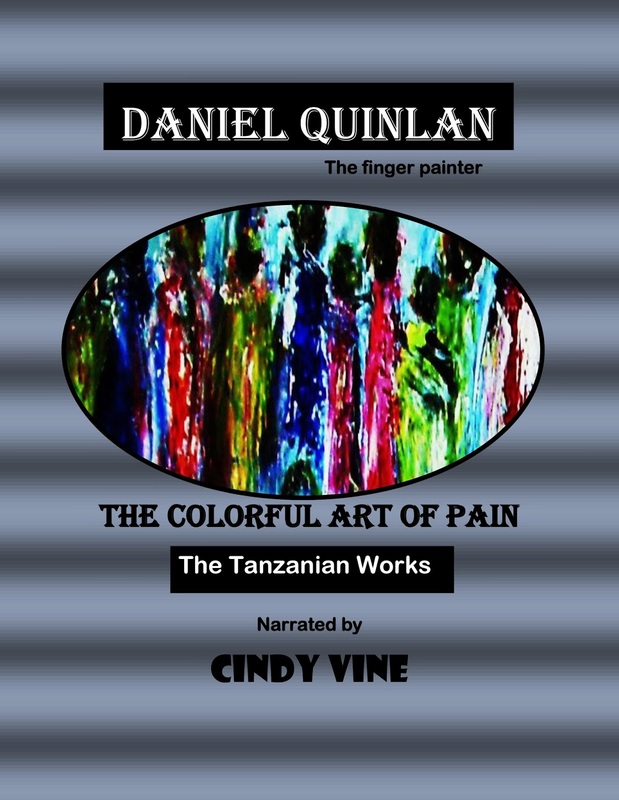 Cindy Vine is the author of thought-provoking novels, a handful of children's stories, a hilarious travel diary, couple of self-help books and a joint effort with renowned Canadian artist Daniel Quinlan. All her books are available on Amazon as print copies or kindle books. 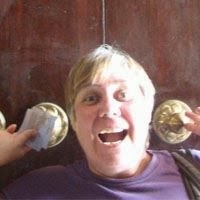 Ron Knight has been writing books for quite a while and is pretty successful. This article appeared on his blog http://www.upauthors.com/earning-50000/ You can get a copy of his marketing guide for free. What a bargain! I know that many authors want to earn millions of dollars, but have you ever considered earning $50,000 a year? That’s enough freedom to make writing your career, pay all of your bills, take a few vacations, and even have enough money to invest in marketing and publishing. Your magic number is 1,000 loyal readers. The key word in that sentence of course is loyal. Those 1,000 readers must be reliable and dedicated to purchasing your books and ancillary products. There are about 65 million people who read an average 5 hours per week, finish a book in about 10-14 days, and purchase 20-25 books a year. Your second most important word in this blog is fan. This goes beyond the average reader. Instead, you have someone that is enthused about purchasing your books and products. Think about Hunger Games. The book is just one avenue of the sales. The ancillary products make millions, not to mention the movies. ~ Loyal fan spends $10 a month purchasing your books/products. 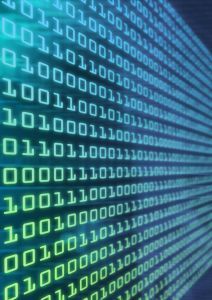 ~ Your royalty/profits are $4.17 per month. ~ Yearly royalty/profits are $50.04. ~ 1,000 dedicated fans x $50.04 = $50,040 per year. If you release only one book per year this can be difficult. However, don’t push your creativity. Remember that you’re building a career, so that means you are writing several books the best you can while adding ancillary products each year. How do you gain 1,000 loyal fans? Of the 65 million readers, you just need 1,000 that really love your work and everything that you have to offer. But where do you find 1,000 loyal fans? ~ Cities that have the largest population of your target readers. ~ Ideal bookstores that have the best chance to sell your books. ~ Schools and universities that have the largest percentage of your ideal readers. ~ Libraries in your targeted cities. ~ Places where your target readers spend the most time. ~ Media outlets located in your ideal cities. ~ Book clubs that are loaded with your target readers, along with the contact information in each club. ~ Lists of regions around the world that have the largest percentage of your target readers. If you spend about $30-$50 a month on marketing, you can obtain a list of places where you can find the largest percentage of ideal readers and fans that you’ll have the best chance at selling your books and products. Another option is that you can speculate on cities and book clubs around the world that will fit your needs, but it’s better to obtain a list which will save you time and money while putting you in a position to succeed and earn $50,000 a year. 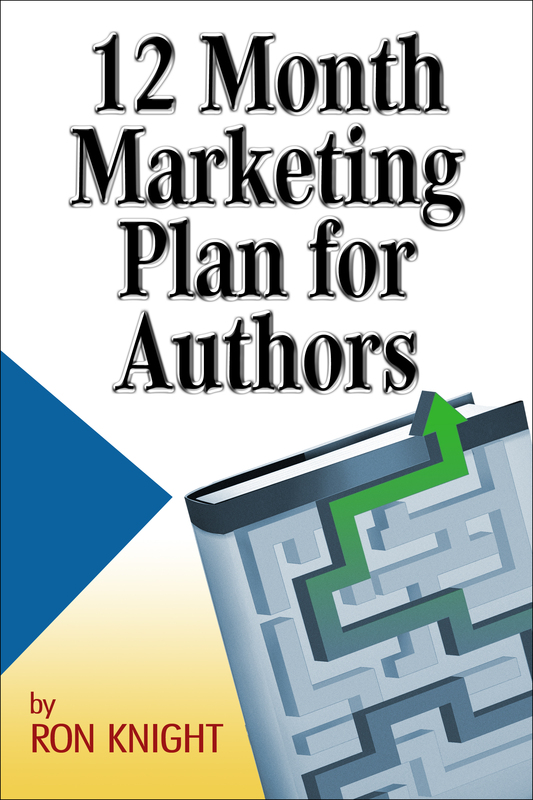 Here is your 12 Month Marketing Plan for Authors! FREE BOOK!